A Word document for organizations to give to parents announcing KidCheck, explaining the benefits of KidCheck, and the importance of setting up their account. A 1-page PDF for organizations to give to parents, guardians, volunteers and employees explaining the benefits of KidCheck and how to create a free personal account. A short video that walks through the account creation process for parents, guardians, volunteers, and employees. To download, right-click the link above and choose "Save As". A short video that walks through using the KidCheck mobile app to create an account for parents, guardians, volunteers, and employees. To download the video, right-click the link above and choose "Save As". A letter for organizations using Express Check-In to give to parents to introduce the feature and provide an overview of the process. The "Express Parent Instructions" document provides more detailed instructions. A 1-page PDF for organizations to give to parents, guardians, volunteers and employees explaining how to create an account and use the Express Check-In feature. A printable 8.5” x 11” sign organizations can print and display on site to give parents a quick overview of how Express Check-In works. A short video that walks through the Express Check-In process for parents, guardians, volunteers, and employees. To download, right-click the link above and choose "Save As". A one-page PDF guide that explains how to use the admin console on Android/iPad Stations and on the App. A step-by-step PDF guide for organizations to give to volunteers and employees on how to set up accounts and complete check-in and check-out. A one-page PDF guide that walks volunteers/employees through starting & stopping check-in. A one-page PDF guide that walks volunteers/employees through starting & stopping check-in using Mobile Devices. PDF-format announcement poster for organizations to inform parents about KidCheck, and request they set up their accounts. Feel free to use this form as is or as a starting point for your volunteer application. A KidCheck desktop wallpaper for use on check-in stations. 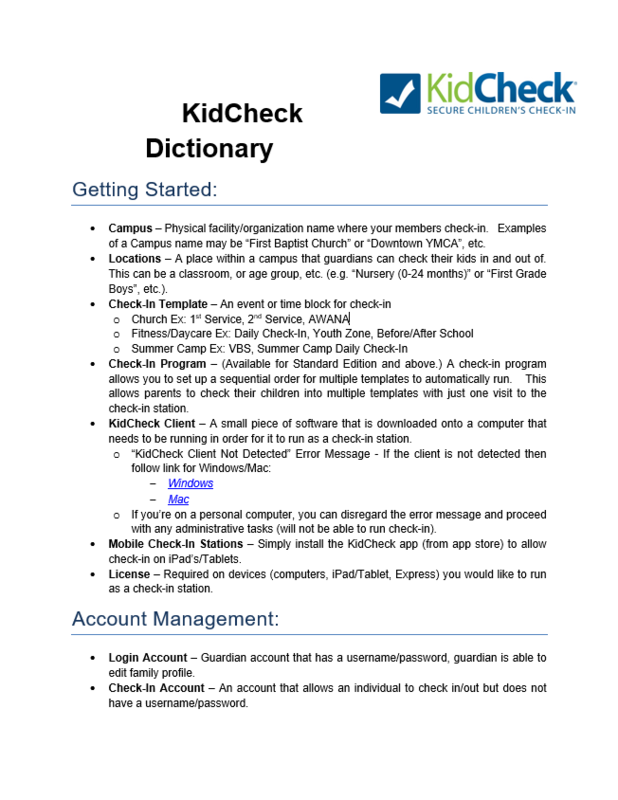 A one-page dictionary of KidCheck terminologies. JPG version of the official KidCheck logo. EPS version of the official KidCheck logo. 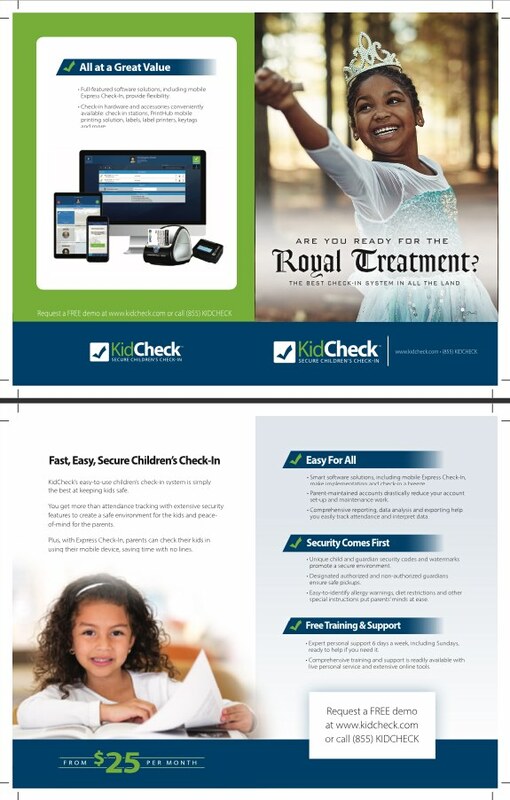 A two page PDF brochure highlighting the KidCheck secure check-in system. A printable version of KidCheck's software editions, features, and hardware available for sale. A printable PDF of KidCheck's feature comparison chart. Perfect for printing and sharing what is included in the Essentials, Standard, Premium, and Campus feature sets of KidCheck.